Tangled and True: yoga help. I've always loved the idea of yoga. I've been to a few classes that made me feel like I could conquer the world and I'd like to have that feeling every day. So I'm on a quest to find the ultimate in "at-home yoga". That's where I need your help, your advice and recommendations are greatly appreciated. We're talking the best gear, clothing, videos, tutorials, books, you name it, I want to know it. Ditto that, girlfriend. Especially the videos! Missy did a great post about yoga back in may. Look here: http://www.tangledandtrue.com/2007/05/get-in-shape-yoga.html. Some perfect tips for videos, clothing, etc.! Best yoga pants (or exercise pants for that matter): lulu lemon. They are AWESOME! This is going to sound slightly cheese-y but I've liked the yoga on our Wii Fit. It plays relaxing music as it shows you through poses. It's also nice because you do it on a balance board so it senses if you are putting too much weight on your heels, toes, hands, or whatever. I've loved the Wii fit yoga as well, plus it's fun and feels like you're playing a game. 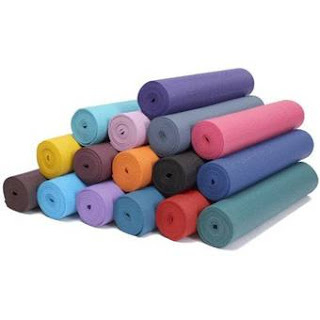 my favorite environmentally friendly yoga mat is by manduka. (http://www.manduka.com/) Also, Rodney Yee is an amazing yoga teacher who has many books and videos that you can definitely use at home. (http://www.yeeyoga.com/) A favorite book of mine by him that helped me learn to do yoga at home on my own terms is: Moving Toward Balance: 8 Weeks of Yoga with Rodney Yee. Good luck!!! The best book in my opinion is Power Yoga by Beryl Bender Birch. It walks you through everything you could imagine step by step. Tells you the meaning of things, etc. My favorite mat is by Mandara. I went to a free yoga class at a Lulu Lemon store - nice stuff, but super super super super expensive. Their mats were really squishy, though, which I liked. adidas has great yoga apparel. I love the "Yoga Zone" DVD's. You can purchase a box set with various workouts on Amazon. They are my favorite and such a great workout.